With well over a million downloads, Rise of Kingdoms is quickly gaining attention of gamers all over the world. At the time of writing this post it is trending on Play Store at the number 5 spot in strategy games. 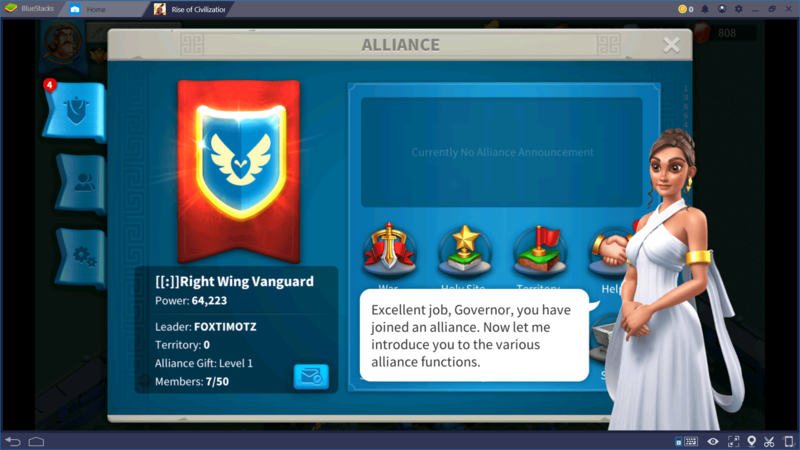 Before we go any further, let’s just take a moment to appreciate the awesome UI and graphics of Rise of Kingdoms. Everything from the characters to the buildings is designed in great detail. The game is based in a single enormous map and offers the user the ability to zoom in on individual cities. In the ‘world view’ you get an overview of the entire map. 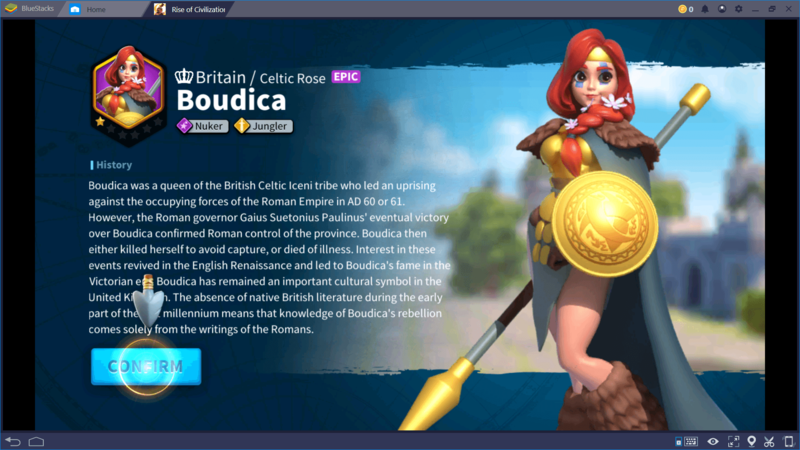 Playing Rise of Kingdoms on BlueStacks is a rich and rewarding experience. Being not limited to a small mobile screen, you can make the most out of the huge map of the game. 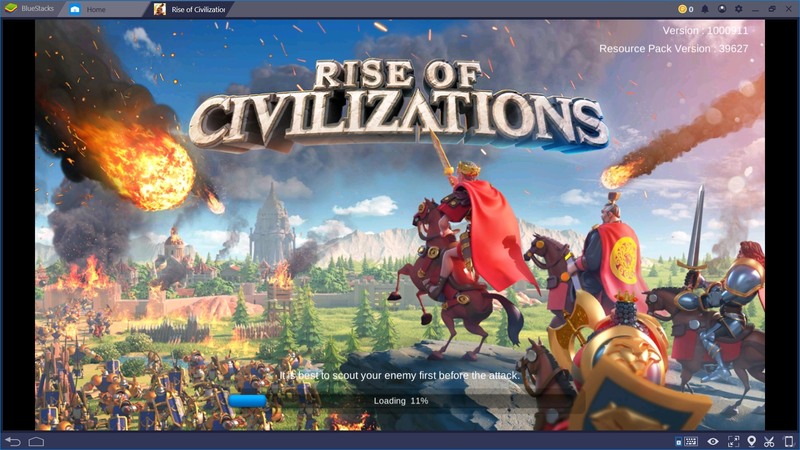 Seamlessly transition between ‘world view’ and individual cities using the power of BlueStacks. In the simplest possible terms, you as a governor are responsible for building a great city. This is achieved by gathering resources and building/upgrading your buildings. Troops also play a pivotal role in this game and are used to attack other cities, defend your city and/or collect items from the map. 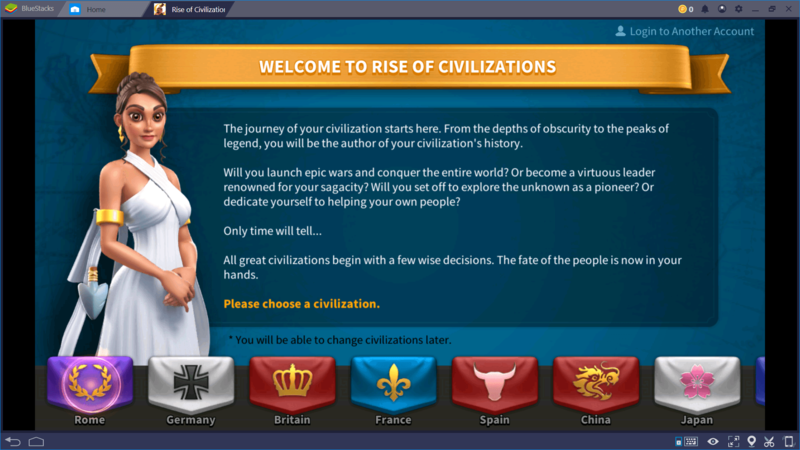 You can choose one of the 8 available civilizations to start with. What makes this game unique and fun to play are the 20 distinct heroes and game modes like Expedition and PvP mode. 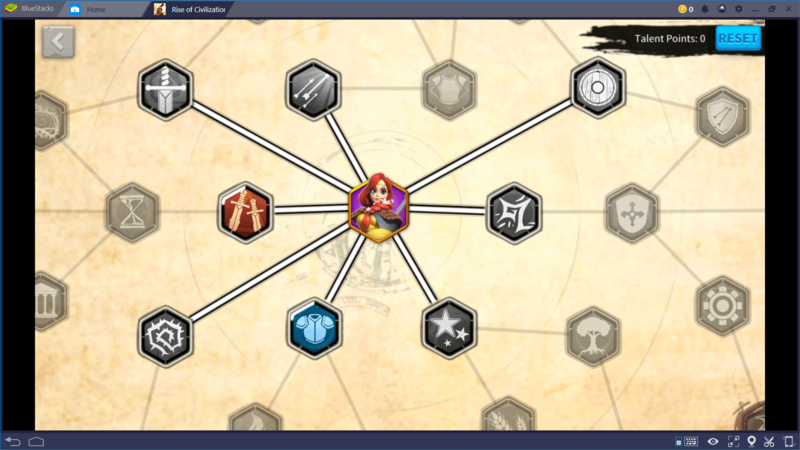 An in game tutorial is offered for new players to make them familiar with the game mechanics. It is a pretty decent introduction to the different elements available in Rise of Kingdoms. 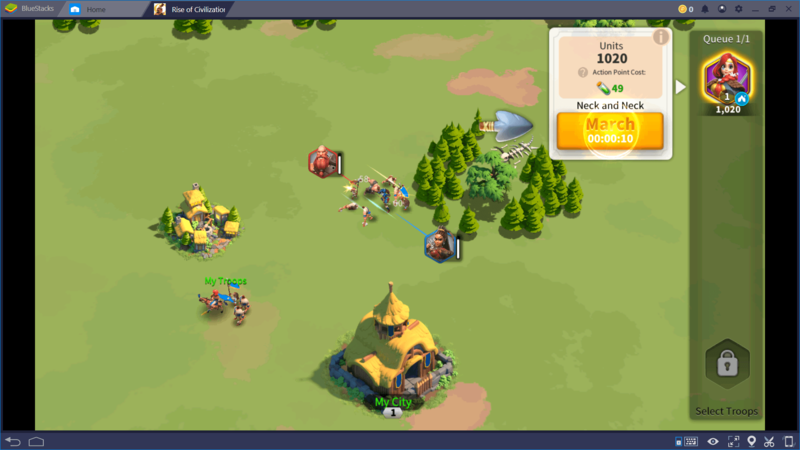 As an RTS (Real Time Strategy) game, Rise of Kingdoms is surprisingly simple to play. Mouse movements on BlueStacks make the game a breeze to play and amplify the overall gaming experience. Resources are vital to progress. The basic three are food, stone and wood. 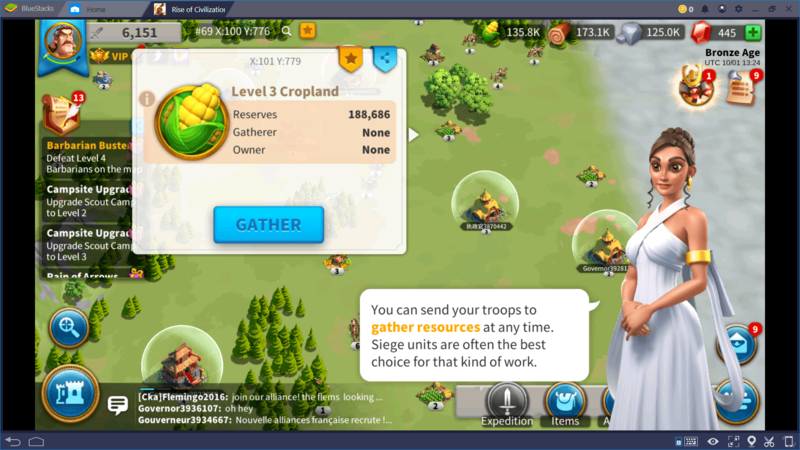 The foremost tasks of the game like upgrading buildings, training troops and doing research all require these resources. Farm, Lumber Mill and Quarry are the three resource generating buildings. You may also collect resources from resource points on the map. These include croplands, logging camps and stone deposits. Buildings are divided into two main classes, Economic and Military. A third category of decorative items is also available for gamers seeking a bit more aesthetics. The city hall is the core of the city. 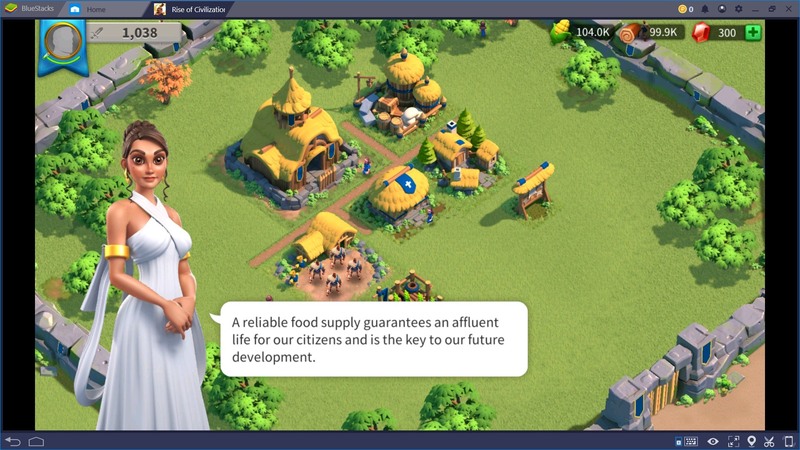 The Economic class contains buildings like farm, lumber mill, quarry, gold mine, academy and storage. As the name suggests, Military buildings deal with troops. Barracks, archery range, stable, tavern, scout camp, hospital and siege workshop are part of this class. Commanders are the leaders of the army. They are used to lead the troops to battle or to gather resources. Commanders can also be assigned to the wall to defend the city. Using different commanders, forces may be split up to perform multiple actions at the same time. Historical figures like Sun Tzu and Julius Caesar can also be called upon. 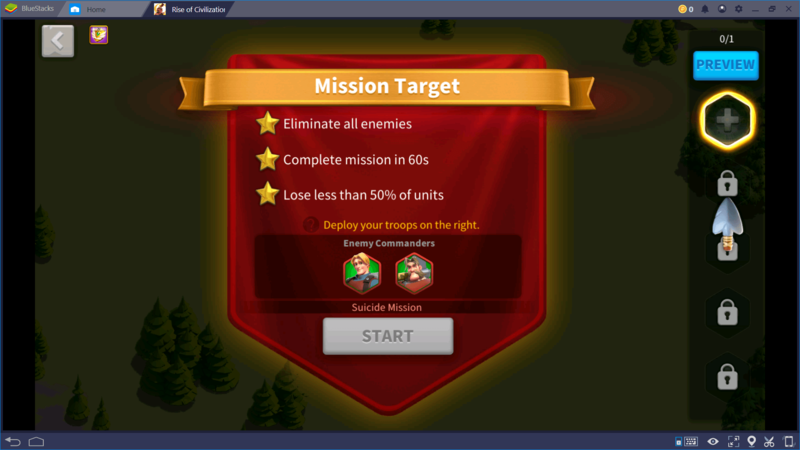 Commanders can earn points and level up as they defeat more enemies. Each commander has some unique abilities that can be leveraged during battle. Gamers familiar with RPG games will be happy to see the familiar tree-style talent upgrades. Acquired talent points can be used to upgrade the talent abilities of the commander to make them more powerful. Similarly, skills can also be upgraded using the skills option. Troop movement is fairly simple. In order to attack, barbarians perform the search or select the target on the map. 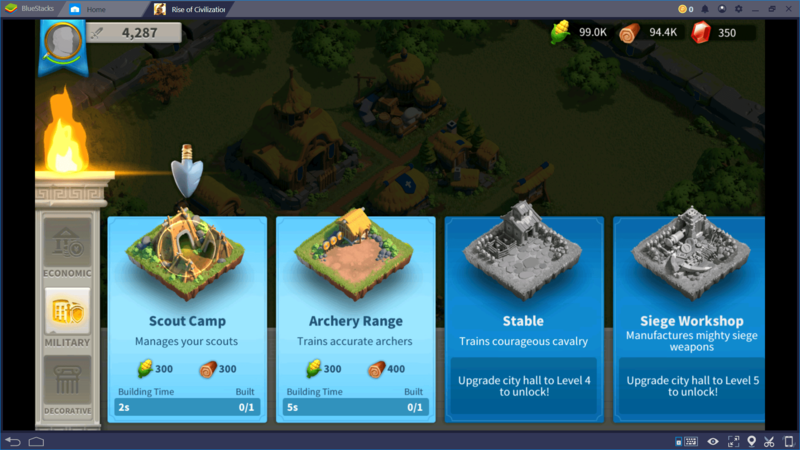 By clicking on the target you can select the number of troops and the commander you want to lead the troops with. Then just order them to march to your desired destination. In the expedition mode you have to complete a series of missions. The goal is to get three stars in each mission. Mostly the missions are time based or damage based. In this game mode you have free control of your troops. Scout the enemy and command your troops to battle and defeat them accordingly. In some missions there are more than one enemy forces and it might not be wise to engage them simultaneously. A pro trick is to lure one of the enemies to come near you and then battle them individually. This can be achieved by strategically moving near to the desired enemy. Gems can be used to speed up troop production or getting instant upgrades. While it may be tempting for new players to use gems this way but it is not a wise approach. Like other games of the same nature, Rise of Kingdoms offers VIP levels. The good thing is that upgrading the VIP level is not restricted to cash only and gems can be used for this purpose. Trust us when we say that you will be better off spending your gems on VIP level upgrades compared to any other aspect in the game. How to get more gems? As with most games, gems are purchased using actual currency. To get free gems be on the lookout for a ‘pile of gems’ on the map. Collect these gems by sending your troops to the location. The research titled ‘Jewellery’ must be completed in the Academy to obtain these gems. Joining an alliance and completing certain quests also gives you some free gems. Certain free items are offered to new players. All these items are pretty useful for game progression and must be availed. 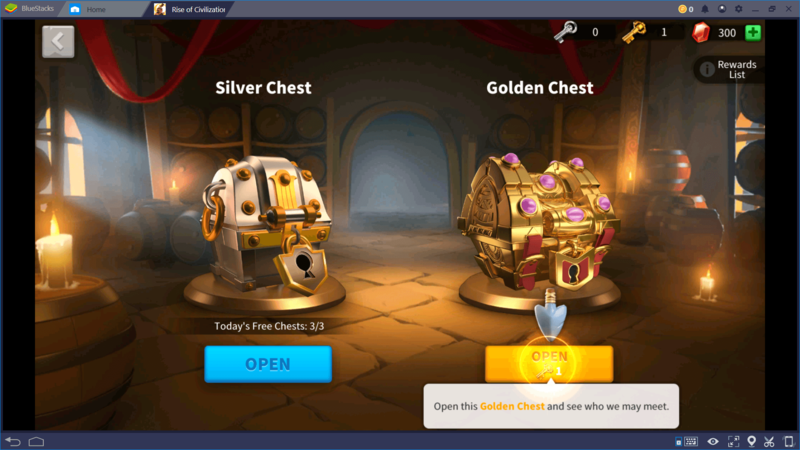 By visiting the Tavern you can open the free chests. Also keep out an eye for daily rewards and any offers that you receive in the mail. Linking the game to Facebook also earns some gems. Alliances are pretty useful. You not only earn gems by joining one but can also receive help from your allies of various natures. Be sure to help others also to gain credits. 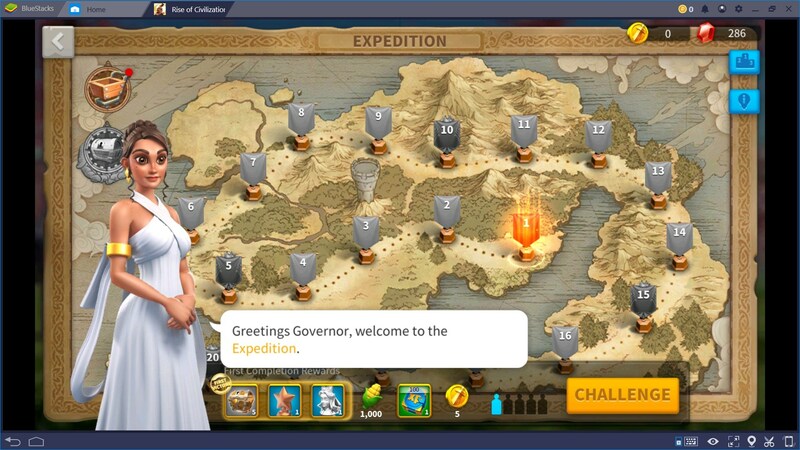 With BlueStacks you don’t need to wait for other allies to come online to receive help. Leveraging the multi-instance feature you can ‘become your own ally’. 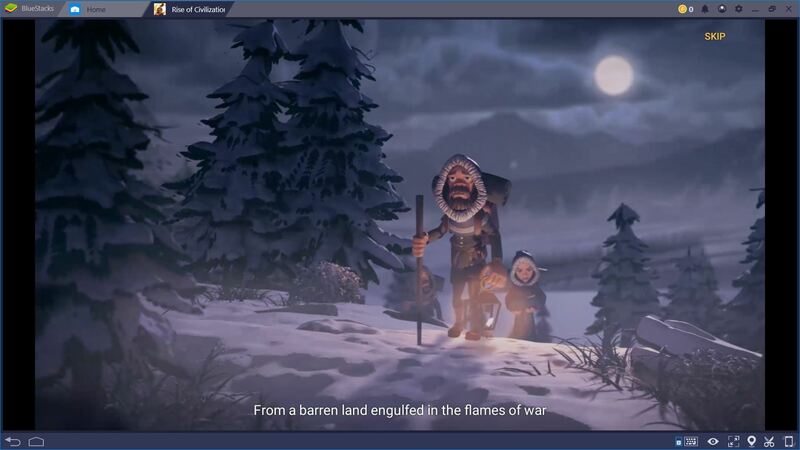 This multi-instance feature is greatly beneficial to progress quickly in games of this nature. The map is engulfed with fog. Scouts are an important part of the game as they are used to explore new areas by clearing out this fog. Scouting an enemy is also useful before launching an attack. Using your scouts effectively can give you a great edge. 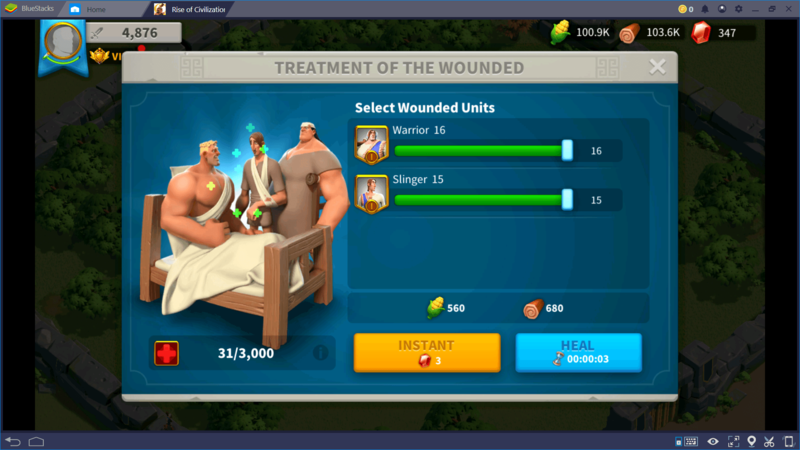 Use the hospital to treat wounded troops after battle. While troops that have died cannot be recovered but healing the injured ones is beneficial. Defending your resources and your city is a big part of the game. In order to stand a chance against the invaders it is advised that you not only upgrade the wall but also pay attention to the watchtowers. By making use of the tips and tricks given above you can make the most out of Rise of Kingdoms. The exciting new features and upgrades are sure to keep you hooked to this wonderful game.